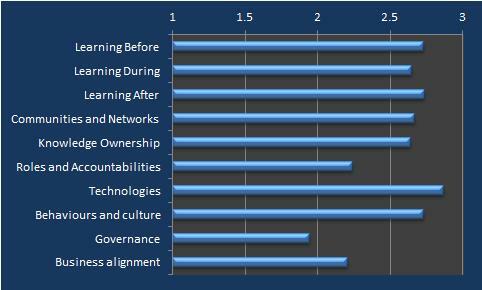 Our Knowledge management surveys in 2014 and 2017, responded to by over 700 knowledge managers world wide, addressed (among many other things) the issues of barriers and enablers to KM programs. 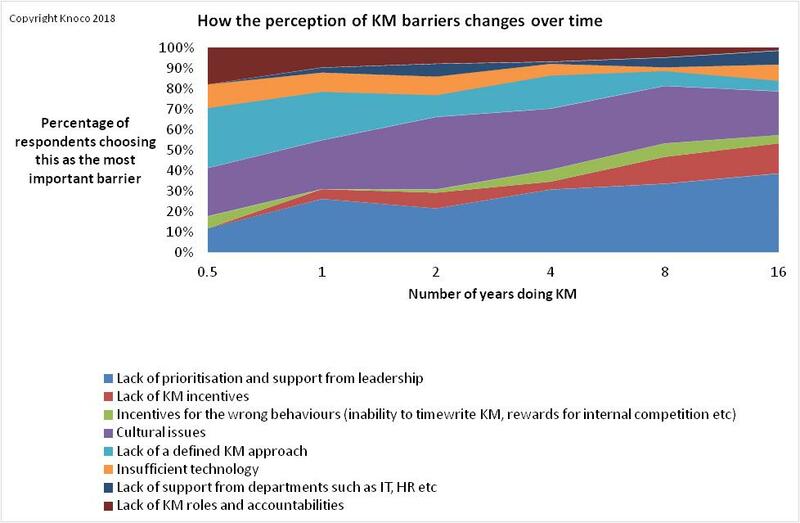 You can see the results in an earlier blog post “KM’s biggest barriers and enablers – new evidence“. Recently I experimented with crossplotting these barriers and enablers against the length of time the respondent’s organisation had been doing KM, to see if the perception of these barriers and enablers change over time. Results are shown below. These graphs show the percentage of respondents, for each length of time doing KM (half a year, 1 year, 2,4,8 and 16 years) choose each of the barriers and enablers as “the most important”. “Cultural issues” do not really change very much in their perception as a barrier over time, but grow in importance as an enabler, presumably as an enabling culture is developed. More data on the global KM market? Here is some more data on the global interest in KM. The question is, how we interpret this data. 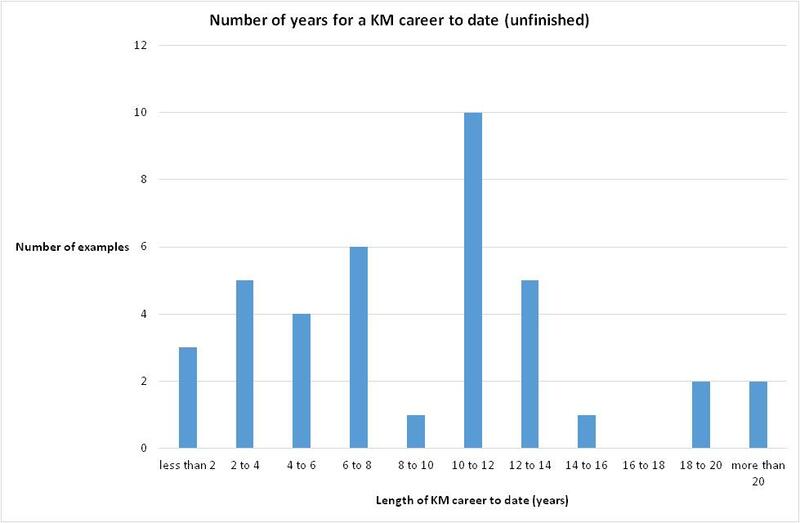 I am always looking for data on the state of the KM market, as a counter to the people who tell us “KM is dead”, or “KM is all about AI nowadays”, based on their personal hunches. Here are some more potential datapoints, but it may be difficult to interpret them. 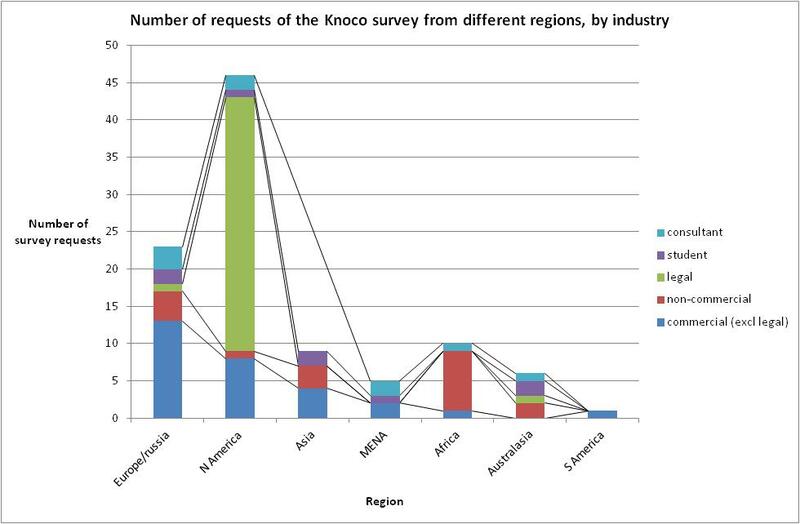 A couple of weeks ago Knoco opened the results of our Knowledge Management survey to the public, and I thought it would be interesting to see where the demand for this survey came from. So after the 100th copy had been ordered, I did a quick review to see where these orders came from. The results are shown above. These results, dominated by the US and Europe, could just reflect the readership of this blog, and the fact that the blog is an English-language blog. But see how much the American requests come from their legal market, and how much the African requests from the non-commercial (public and development) sector. There’s something else at work here. Let’s look at these results through a different lens – that of industry (below). These results are less likely to be biased by the readership of this blog, because we are no looking at geography. But geography comes into this as well – look how the legal requests almost all come from the US, and how half the public/development sector requests from from Africa. Requests from other sectors are pretty well spread across the regions. The caveat, of course, is that the distribution of the announcement of the release of this survey may not represent the global market, and that the results are skewed by the way the announcement was forwarded. Perhaps a community of US legal KM folk circulated the announcement? I will gather more data over time, and refine the picture. We have decided to open the results of our KM Survey to the public. In April 2014, and again in April 2017, Knoco Ltd conducted a global survey of Knowledge management activity and trends. Participation was free and confidential, and all participants received a free Knowledge Management Survey report. 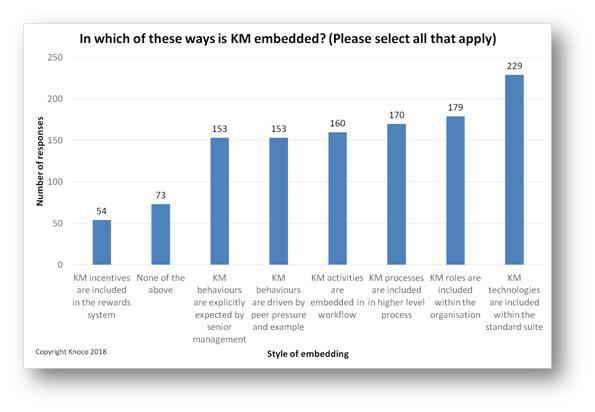 Over 700 people have taken part in the surveys; mostly individuals leading Knowledge Management activities or members of Knowledge Management teams. A combined Knowledge Management Survey report is now available to interested parties. The main outputs from the report are listed below, and the survey report contains 45 charts and 29 tables of data. You can order a copy here – all we ask for in return is to know who you are, and what use you plan to make of the survey. We have put a vast amount of work into the report, we are really proud of it, and we are very interested in what people make of it and how they use it. So please fill in the order form online, and we will mail you a copy within a day or two. 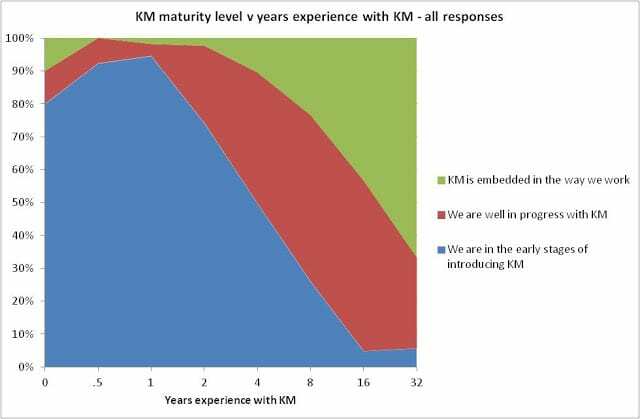 The maturity of KM across the world, across business sectors, and by company size. The length of time it takes to reach KM maturity. The main reasons why people give up on KM. Typical KM budgets and how they vary with company size. 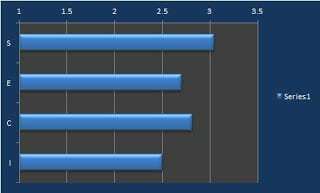 Typical KM team sizes and how they vary with company size. The skills within KM teams, and where they report. How KM is embedded, and the impact on value. KM technologies, their function, use and value. KM processes, their function, use and value. 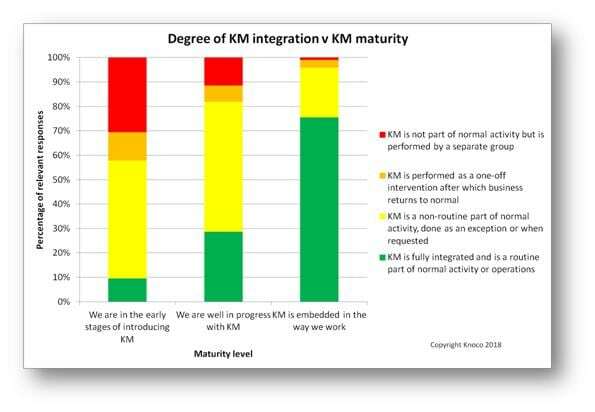 The main KM governance elements in use, and how these vary with KM maturity. The most common barriers and enablers for KM. 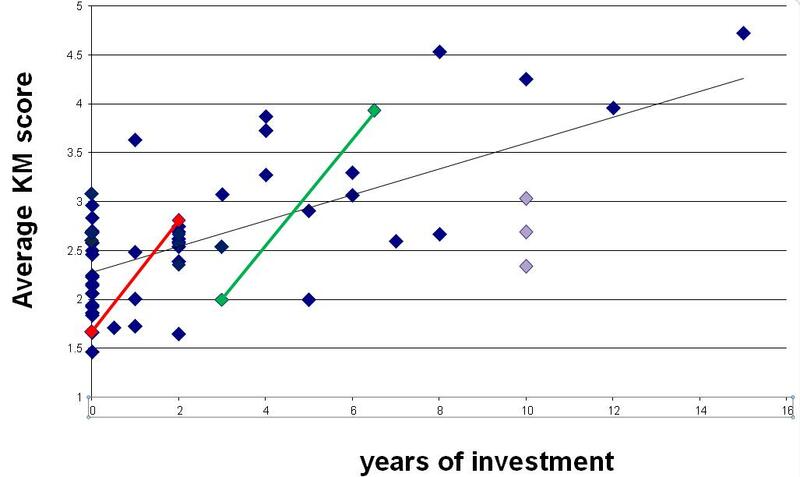 The effectiveness of various KM metrics and incentives. The main cultural isues and where they prevail. The popularity and effectiveness of Best Practice approaches, how they work, what value they add. The popularity and effectiveness of Lesson learned approaches, how they work, what value they add. The popularity and effectiveness of CoP approaches, how they work, what value they add. 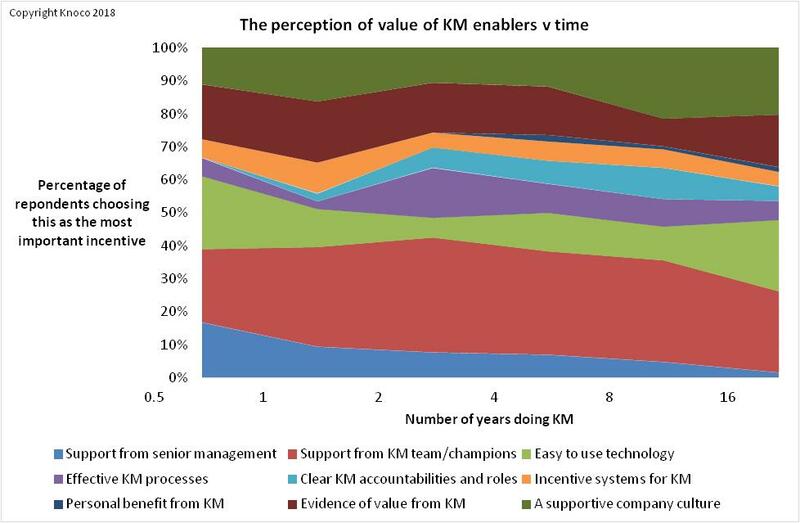 There are 5 ways in which KM can be embedded in an organisation. Some of these are more common than others, and to fully embed KM can take over a decade. I often have people ask me what “embedding” Knowledge Management actually means, and how you do it. Embedding Knowledge Management means making part of the normal work process, rather than an add-on. 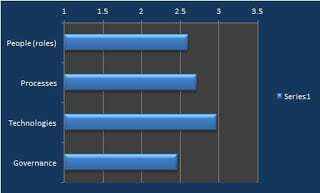 You do this in six ways, listed below in the order of most common applicaiton, as shown in the graph above. You change the technology suite so that Knowledge Management tools are available, and used, as part of the working toolkit, and linked into the existing work tools. While email remains the number one work tool for many people, then link your KM tools into this, rather than requiring people to acquire a new habit. New habits can develop later, when KM becomes part of natural behaviour. You change the Organigram to include Knowledge Management roles and accountabilities. You introduce new roles where needed (lesson teams for example, leaders and coordinators for the big Communities of practice, Practice Owners and so on), and change some of the accountabilities of existing roles (the most senior experts, for example, need clear KM accountabilities, as described here. You need to change their job descriptions, so that they are held acountable for stewardship of the company knowledge). Then you measure and reward people against their performance in these roles, and against these accountabilities, just as you measure and reward them against any other component of their job. You change the high level processes and activities, embedding Knowledge Management processes and activities into the work cycles (using the principles of Learning Before, During and After). Change the project requirements, to include mandatory processes for capture of knowledge at the end of the project or after key milestones, and mandatory processes for reviewing past knowledge at the start of the project. Change the rules for project sanction, so a project gets no money if it hasn’t done any learning. You change the behaviours through peer pressures and through management expectation. You change the governance system to include KM. Write it into the policies. Write it into the way people are rewarded. Change the reporting requirements, the HR appraisal mechanism, change the incentive scheme to reward collaboration and discourage competition. This is the least common embedding approach, but it needs to be done eventually. These changes should embed KM as part of the way people work, and so make KM part of everyone’s job. Once this is the case, you can claim KM is embedded and fully mature, as shown below. However this takes time. 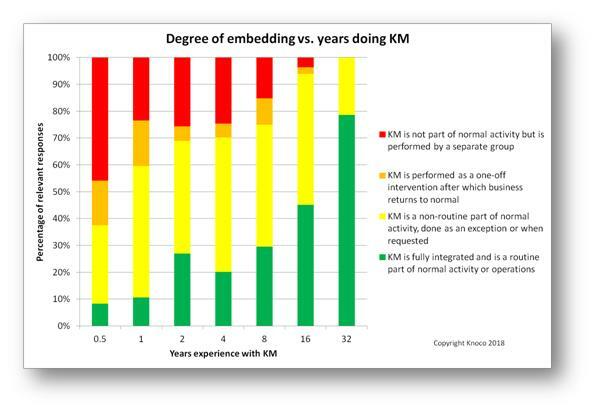 The chart below shows how this level of embedding varies with the length of time organisations have been doing KM. Even after 16 years working with KM, only half the organisations claim KM is fully integrated and routine, rather than a non-routine activity. Again yesterday I was corresponding with someone who used Google Trends as an argument that KM was dying. Taken at face value this view is understandable. 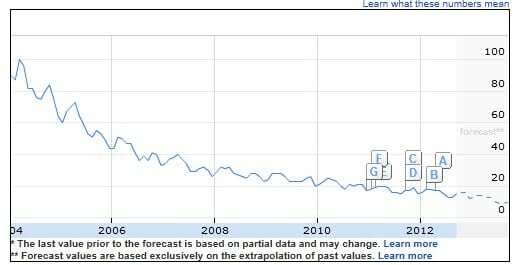 The google trends plot for KM decreases over time as shown below, showing a steady reduction in relative searches for the term “knowledge management” over the past 8 years. 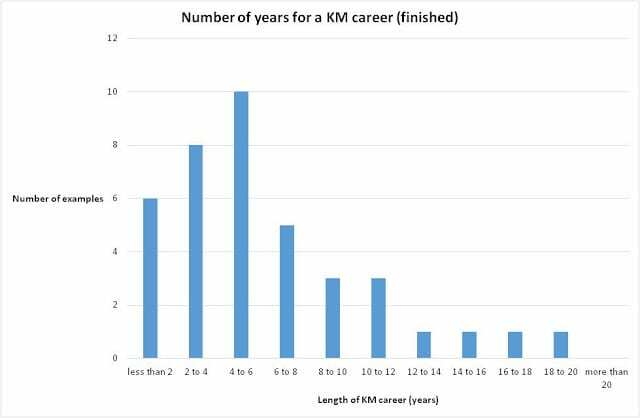 At first sight this could suggest that the popularity of KM is on the wane, and that fewer and fewer people are searching for the term. 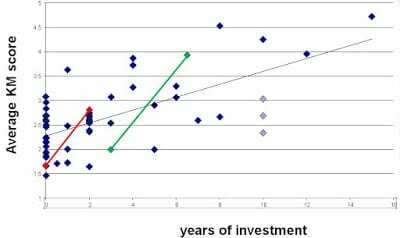 However if you dig a little deeper this plot is misleading, and the conclusion that interest in KM is dying is actually a fallacy. Google trends is not an absolute indicator of the popularity of a topic. That is because Google trends measures “how often a term is searched for relative to the total number of searches, globally”, and the total number of searches, everywhere in the world, has rocketed (screengrab from this site below). Any decrease in the relative percentage, as in the first graph, has to be normalised against the increase in the total number of searches in the second graph. If the top graph is a measure of the percentage and the bottom graph is the total, then all we need to do is multiply them together to get a measure of the total number of KM searches, and then we will be able to say something meaningful. That is exactly what I have done in the plot below. The numbers are inexact, as I have just read points visually from the first plot (see table at the base of the post for figures) but the conclusion is obvious. 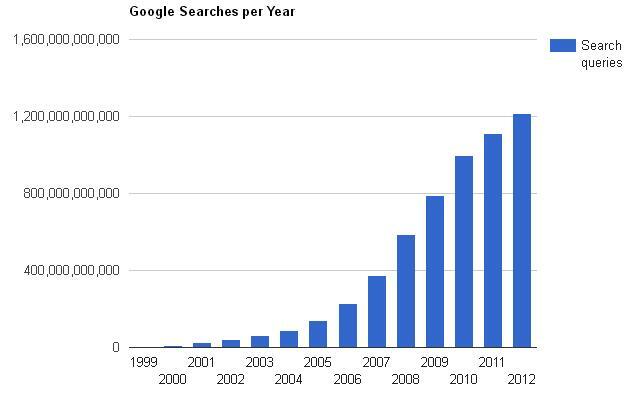 … the total number of Google searches for Knowledge Management has actually increased steadily from 2004 to 2012. The “KM is Dead” meme is one with a long history; see articles from 2004, 2008, 2011, 2012, 2015, 2016 to choose but a few. It still seems to resurface several times a year; usually when a software vendor has something to sell (example). 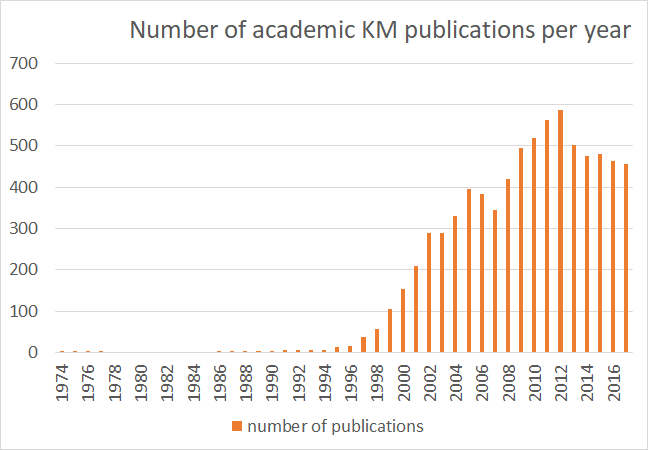 I don’t think you could look at this plot and say KM is dead. You might say it has slowed down a little since a peak in 2010, and that the current number of publications is at about 80% of peak levels, but that’s a long way from being dead or dying. Is KM dead? According to the number of academic publications – No!